Denise Dennis, direct descendant of the original settlers of the Dennis Farm and president of the Dennis Farm Charitable Land Trust, will serve as the keynote speaker at the seventh annual Dennis Farm Symposium at Keystone College on Thursday, Oct. 11. 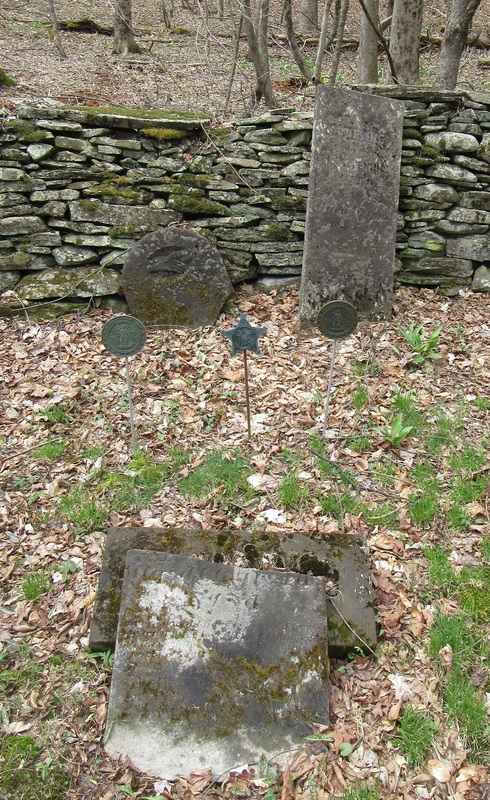 In late April, she paid a visit to the homestead near Kingsley in Susquehanna County, where a marker listing early settlers sits near the family cemetery. 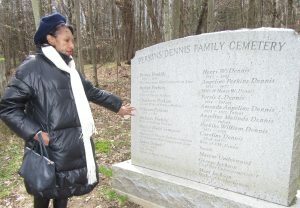 Settled by a free African-American family in 1793, the 153-acre Dennis Farm in Susquehanna County was at one time an anomaly that endured well into the 20th century. 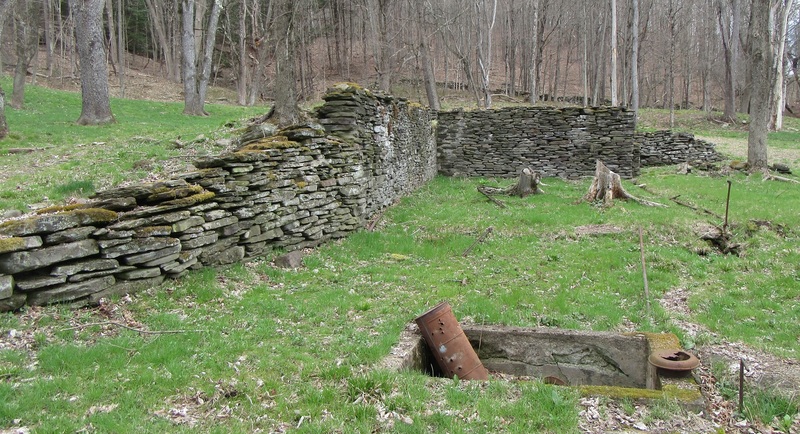 Currently under renovation, the remaining 19th century farm house is surrounded by barn and outbuilding foundations (top), stone walls that disappear into the forests, and original root stock from the vast orchards that grew between farm fields. In an elegant and isolated family cemetery perched high on the hill above the farmstead rests the remains of both family members and African-American veterans of the Revolutionary and Civil wars. 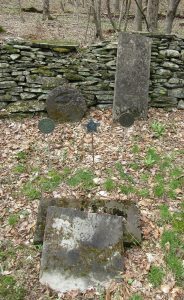 Prince Perkins was in fact a Revolutionary War veteran who was awarded a land grant by the Commonwealth of Connecticut, which still claimed sections of Bradford, Sullivan, Wyoming and Susquehanna counties that would later officially become part of Pennsylvania. His granddaughter, Angeline and her husband, Henry W. Dennis settled on and expanded the farm in the mid 1800s. Today, the site has been recognized for its historical significance and is the subject of a two-day symposium at Keystone College, Wednesday and Thursday, Oct. 10 and 11. At 7 pm on Oct. 10, a forum will be held in Brooks Hall titled “It Begins with Each of Us: Fostering Racial Understanding.” Registration is appreciated by Tuesday, Oct. 2 at DFCLTforum@gmail.com. The goal of the forum is to address and look for ways to heal the growing racial and cultural wounds afflicting the nation. A report from the forum will be delivered the next day at the Sixth Annual Dennis Farm Symposium. Thursday’s program will begin at 10 am and will feature presentations from historians and other experts familiar with the Dennis Farm, as well as Dennis Farm Charitable Land Trust (DFCLT) president and direct family descendant, Denise Dennis. Highlights will include an overview of the site as a national, state and regional heritage asset, numerous milestones of the Perkins-Dennis family, a catered luncheon, and a tour of the Dennis Farm near Kingsley, for which transportation to and from the college will be provided. There will also be a photo exhibit. 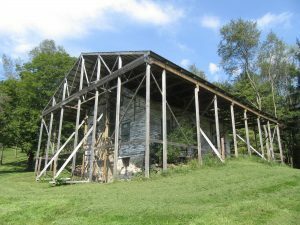 The DFCLT has found numerous heritage partners and community support for their efforts, including the Endless Mountains Heritage Region, which provided funding to assist in the development of a comprehensive Interpretive Plan that details how the farm will be restored and enhanced to provide educational experiences with a new visitors center, exhibits and programming. In 2018, the EMHR added the Dennis Farm to the Susquehanna County Heritage Attractions map and interpretive panel, one of which was installed next to the Susquehanna County Historical Society Museum in Montrose. The DFCLT will continue to work with the EMHR to collaborate on events and workshops in the coming years. Interested readers can register for Thursday’s activities by logging on to https://mailchi.mp/c0bceab41ee1/sixth-annual-dennis-farm-symposium-3304061?e=3f1a7dad3f. 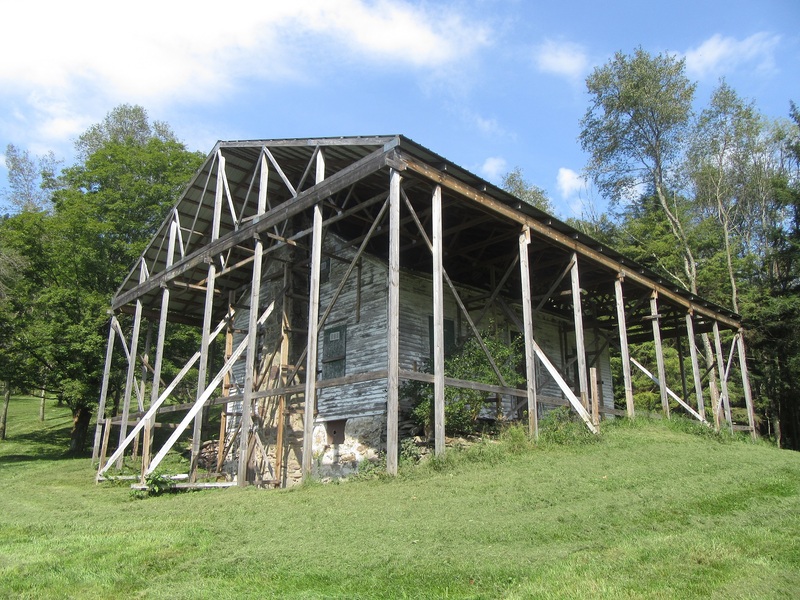 To prevent further collapse before it can be renovated, the Dennis farmhouse has been encapsulated under a temporary roof. It is hoped that the building can be renovated to house exhibits.